HP UFT (Unified Functional Testing) latest version of QTP Tool, QTP Supports Functional and Regression Testing for GUI (Windows and Web) based Applications, where as UFT supports GUI and API (Application Programming Interface) Testing for GUI based Applications. It is a Functional and Regression Test Tool, it also supports little bit performance testing, reliability testing. It is an Object based Test Tool, based on front-end objects it performs test operations. 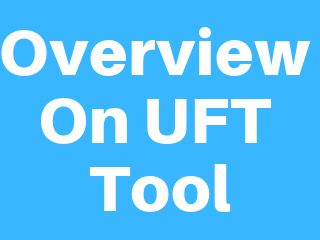 UFT is I-tier Application or Stand-alone Application or Desktop Application, then how UFT stores its resources?, UFT stores its resources using file format on File System (Hard Disk). UFT developed in VC++.NET technology, whenever we install UFT for first time, first it installs .NET framework then UFT Components. UFT has SQL engine for Database operations, we can execute SQL commands in UFT Tool Editor. UFT has VBScript engine for Scripting, we can use all VBScript features like variables, constants, operators, Built-in Functions, user defined functions, Conditional statements, Loop statements and Automation objects in our tests. UFT has two programming interfaces one is UFT Tool Editor, another is Function Library. In 2001 Mercury Interactive Corporation purchase Astra Quick Test tool and enhanced some features, released with the name of QTP. In 2007 September Mercury Interactive Corporation taken over by HP (Hewlett Packard). UFT supports Windows operating environment only, it doesn’t support UNIX or Linux operating environment. LoadRunner, Quality center/ALM support Windows and UNIX/Linux operating environments. Add-in means additional component, UFT tool point of view Add-in means Environment compatibility files. Direct features means features available in UFT Tool main window. We no need to install these tools, If we install UFT then these can be installed automatically. SQL engine for Database operations. MS Script debugger for debugging tests.